From the second you walk into your primary care physician’s office to walking out of your physical therapist’s clinic for the last time, there are many different facets of the healthcare system that you interact with. Now I am no expert in healthcare, however, I would like to offer my insight on obtaining health care from day one to the last day of the injury or illness from my perspective as a patient and health care professional. 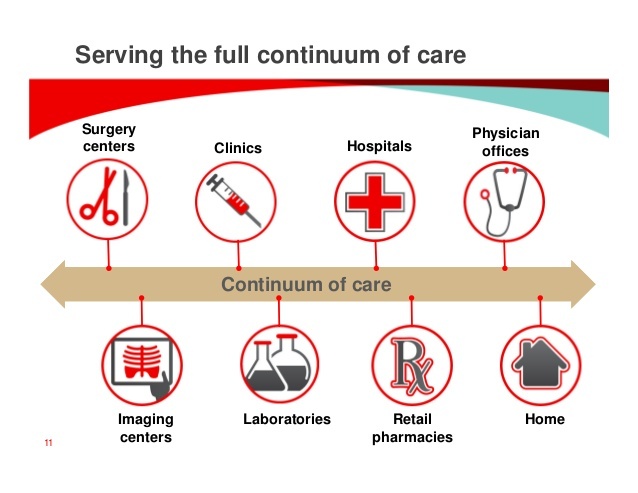 To give you an example of what I mean by healthcare continuum, here is a picture. This is just a few of the major departments or places that you can end up during your journey to “getting better”. It wasn’t until 7 weeks after my surgery that I began to think of all of the things that needed to be done correctly to fix the problem I was having as well as get my fitness level back to where it was before. The healthcare system is complex. Although the places you visit may be in different locations throughout your city, they all work together to diagnosis, treat, and rehabilitate your injury or illness. As a hospital corpsman, I have assisted patients from day one of the illness, to seeing them complete there physical fitness test months later. It can be a complex process that requires the health care professionals to properly diagnosis and push the patient down the healthcare continuum. I want to give you my example so you can fully understand what I mean. And remember, although we think of hospitals, clinics, laboratories, etc as medical facilities, they are a type of business; money does play a factor. 1. OUTPATIENT CLINIC: I presented to the outpatient treatment facility, where I saw my Primary Care Physician (Physician who you go to for routine healthcare). I had a complaint of shoulder pain upon overhead activities. My provider performed a few shoulder tests. As this point the provider could: order an X-ray or MRI, send me to a specialist, or give me ibuprofen and stretching exercises and send me on my way. The provider deemed it necessary to send me for an MRI (without contrast). 2. REFERRAL: This is the part most patients do not see, the referral process. However, it is still a vital part of the healthcare continuum because this is what sometimes pushes you onto the next level of treatment. It is important that your insurance approves the need for the referral so that your out of pocket costs are very minimal. 3. MRI APPOINTMENT: I then received my referral approval in the mail and made my MRI appointment. I presented to the hospital, received my MRI, and a day later received the results. All persons involved are important in the process. From the technician who conducted the MRI, to the radiologist who read the image, and even the health technician who put the results into my electronic health record. 4. FOLLOW UP WITH PCM (Primary Care Manager): I followed up with my Primary Care Physician who looked at my results in which the radiologist recommended another MRI, this time with contrast dye. 5. MRI #2: The same procedure was completed. However, before the image was taken, a needle was placed into my shoulder and a contrast dye injected into the sight of the signal (shade). And then the MRI was performed. 6. FOLLOW UP VISIT #2: The results of the MRI yielded a SLAP tear in my right shoulder. At this point, my PCM wrote a referral to see an orthopedic surgeon who performs shoulder surgeries. 7. ORTHOPEDIC SURGEON: This gentleman performed the surgery to repair my Type 2 Slap Tear in my right shoulder. You can read about it in on of my other blog posts under the category “health”. 8. OUTPATIENT SURGERY CLINIC: Where my surgery took place. 9. PHARMACY: Where I received my post operative medications. 10. PHYSICAL THERAPIST: This is where my shoulder is currently being worked on and rehabilitated to gain my range of motion and strength back. I am currently in the process of light strengthening and maintaining the full ROM I have regained. That will hopefully be the last place I have to go, excluding my last follow up with the surgeon, along the healthcare continuum. As you can see, there is a lot that has to happen and a lot of players involved in treating patients in today’s healthcare. For example, let’s say in the very beginning that my PCM did not send me to get an MRI. Would the tear have been found? Would it have gotten worse? What if the first MRI received was not done correctly and therefore did not reveal anything necessary to receive another one with contrast? Or how about if the physical therapist was not familiar with the protocol for rehabilitating SLAP tears? There were so many people involved in helping me fix my shoulder and I didn’t realize it until I listed them out. So I am going to attempt to list out as many as possible to give you an idea: front desk clerks at all the facilities, insurance claimant, medical assistant/corpsman that helped in the initial visit, Primary Care Physician, MRI technician, Radiologist, Nurses, Doctor who injected the contrast dye, Orthopedic Surgeon, Nurse anesthetist, Anesthesiologist, Pharmacy Technician, Pharmacist, Physical Therapist Assistant, Physical Therapist. As you can see, there were TONS of people who assisted in my care. Each part of the healthcare system is vital to a patient’s recovery. I hope this gave you at least a little insight into the complexity of healthcare in today’s society.